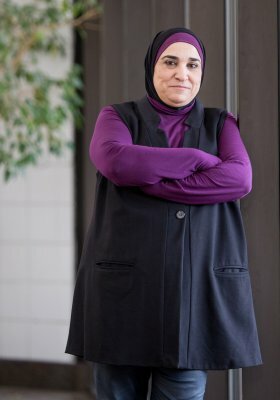 Dr. Kholoud Al-Qubbaj is an associate professor of humanities at Southern Utah University. For the past seventeen years, she has taught Diversity and Arabic Language. 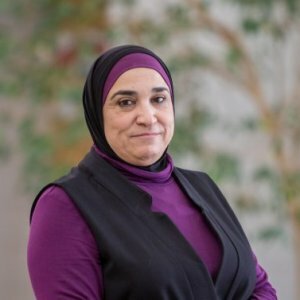 Published multiple times, most recently the book "Acculturation Among Arabic Children and Their Families in the USA" and a research study titled “Gender Identity and Religious Practices of First Generation Muslim Women in the U.S.” In 2012, she edited the published book Dimensions of Global Diversity. Dr. Al-Qubbaj earned a bachelor of arts in English Language from An-Najah N. University and a master of arts in education and a Ph.D. in curriculum and instruction from New Mexico State University. Is America ready for a president who doesn’t meet the traditional norms of our society? That is the question panelists looked to answer Wednesday evening on the campus of Southern Utah University. The event, hosted by the Michael O. Leavitt Center for Politics and Public Service, involved both SUU students as well as the community. There are currently more than 270 Middle Eastern students who have made the 8,000-mile voyage from home to attend Southern Utah University, bringing with them a unique culture that is unknown to most in the southern Utah community. On Wednesday, February 20, however, the SUU Multicultural and International Center, along with the Michael O. Leavitt Center for Politics and Public Service and the SUU Saudi Club, is bringing Islam to Cedar City for a night of open discussion about the Islam culture and Muslim religion. This conflict has yet to be resolved, and the turmoil keeps on continually. The Palestinians and the Israelis have different paradigms of grasping all issues related to the conflict. For an outsider trying to understand the conflict, it becomes very vital to understand the two perspectives of the disagreement. Many factors contribute to the differences of understanding the conflict on both sides: The Arab and Muslims share the same views and interpretation of the conflict which is based primarily on their history and religions. On the other hand, the American public knowledge of the conflict is influenced by; the media, education, and politics. The media has fueled anti-Arab, ant-Muslim and stereotypical feelings of terrorism, dress modesty, the hijab, etc. Lack of true image of Arabs and Muslims in the school curricula triggers stereotypes of these two groups among the new generations. In addition, the religion of the average American, which is based on Zionism, has convinced them to one side of the dispute. This study discusses gender and religious identities of first-generation Muslim women living in the U.S. based on a sample of 33 respondents. All women participating in this research have identified themselves as practicing Muslims and have come from countries where Islam is the dominant religion. The study reports the everyday life challenges these women face practicing Islam, as well as the prejudice and rejection they face as Muslim women. Additionally, the study addresses the dominant and persistent impact of Islamic religion on the gender norms practiced by these women. These women, regardless of their education, age, national origins, and years living in the U.S., expressed unyielding support for these traditional gender practices. The study concludes that these firstgeneration Muslim women have resorted to the traditional cultural and gender-specific norms and practices to negotiate their identity, rather than succumbing to the dominant American culture. This course is an interdisciplinary, term-taught, general education offering. The course will introduce the theoretical and practical paradigm of cultural differences. In this course, cultural difference will refer to race, gender, nationality, class, religion, and age. Students will be encouraged to examine the ways in which these paradigms influence their daily lives and the structure of our culture. This course examines the socio-cultural, political, & economic dimensions of transnational practices across nation-states. It focuses on the causes and consequences of transnationalism. This course examines the changing dynamics of school populations that includes demographics, race, ethnicity, culture, economics, at-risk populations and other current issues.